﻿ Real Madrid 2-0 Levante. All set for the Clasico! 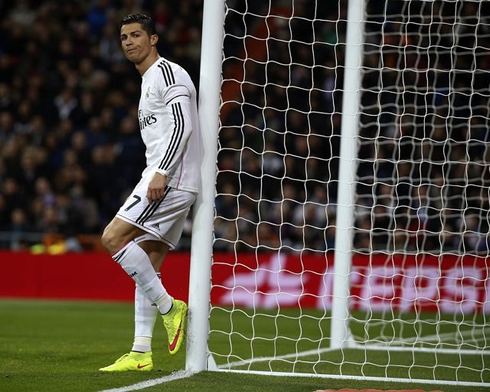 15.03.2015 » Real Madrid 2-0 Levante. All set for the Clasico! Real Madrid will be visiting the Camp Nou just one point behind Barcelona, after beating Levante 2-0 at home this Sunday night. Cristiano Ronaldo failed to find the back of the net, but Gareth Bale stepped up in his place and scored a brace to make peace with the fans. Next Sunday, it's time for another league Clasico between Barcelona and Real Madrid! In what was a relatively simple night at the Santiago Bernabéu, Real Madrid snapped their three game winless streak in all competition, beating Levante 2-0 in what was a rather subdued night at the Spanish capital. Still, the performance did warrant some concern at times, as Madrid's woeful finishing of late continued. The 3 points stayed at home thanks to two goals from Gareth Bale, with the first one coming off a rebound around the 18th minute of the first half and the second taking place just 5 minutes before the break, when he unintendedly deflected a Cristiano Ronaldo shot to make it 2-0 for the hosts. With a Barcelona vs Real Madrid now on the horizon, all bets are off for next weekend! With all eyes on next week's Clasico, Carlo Ancelotti made some changes ahead of tonight's game, giving Lucas Silva a start ahead of the suspension-threatened Toni Kroos, while Keylor Navas was also given the chance to play against his former team and relegate Iker Casillas to the bench. From the first minute, Madrid looked set out to put the game beyond all doubt, but some missteps in front of goal meant that they had to wait until the 18th minutes to get the break through. Luka Modric made his first start and the Croatian's impact was clear. Real Madrid have been sorely lacking that connection between the midfield three and the BBC up front, and though this game only showed mere glimpses at the fluidity we became so used to last season, it was still a marked difference with the midfield maestro on the pitch commanding the operations. The first goal came in the 18th minute from a very motivated Gareth Bale. After an acrobatic effort from Cristiano Ronaldo was cleared off the line, the Welshman pounced placing a right footed volley into the corner of the net. Bale's been under immense scrutiny in recent weeks and he showed it in his celebration. He cupped his hands to his ears as a gesture to the crowd and angrily kicked out at the corner flag before being surrounded by several of his teammates. It was Bale's first goal in nine games! Real Madrid continued to press on pushing forward towards goal, but they would continue to misfire in front of goal. Five minutes before halftime however, they would get their second. A quickly taken freekick from Modric fell at the feet of Dani Carvajal, his cut back fell to Ronaldo, who then hammered a low shot across the face of the goal. The ball was going wide when it deflected off of Bale and into the back of the net. The Merengues had just gotten a 2-goal lead before heading out to the locker rooms. The pace of the game would die considerably in the second half, as Real Madrid tried to put the game away but to no avail. Midway through the half, the hosts would find their best chance after an audacious backheeled attempt from Karim Benzema cannoned off the woodwork, much to the chagrin of the home fans. It would have certainly been one of the goals of the season, if not the best in Karim Benzema's career had it gone in. Real Madrid, however, would not be able to put away a third and the halftime score would be the final result. Despite his assist, it was a frustrating day for Ronaldo, who simply couldn't seem to get his finishing right. But all in all, Madrid were able to make sure that they head into next week's showdown only one point back and with La Liga on the line! Cristiano Ronaldo next game will be the Clasico for La Liga against Barcelona, on the 22nd of March of 2015. You can watch Juventus live stream, Barcelona vs Real Madrid, Barcelona vs Manchester City, Swansea vs Liverpool, Reading vs Bradford, and Atletico Madrid vs Bayer Leverkusen, all matches provided from our football live streams section.